On Sunday when Spurs came out on top against a struggling Swansea side, one of the more interesting subplots of the game was the similar play of Wilfried Bony and Emmanuel Abedayor. Both were operating as the lone front man for their respective teams and were able to influence their team’s buildup and attack play effectively down to their excellent work rates. Spurs won the match fairly easily and Adebayor outscored Bony as well, 2-1, on the day but it’s safe to say Bony deserved at least the one goal and Adebayor certainly had the better supporting cast. All else being equal between the sides, which it is not, the simple fact that Adebayor had Christian Eriksen working behind him and Bony had Jonjo Shelvey as his supporting attacking mid certainly goes a ways in tipping the odds in Adebayor’s favor. 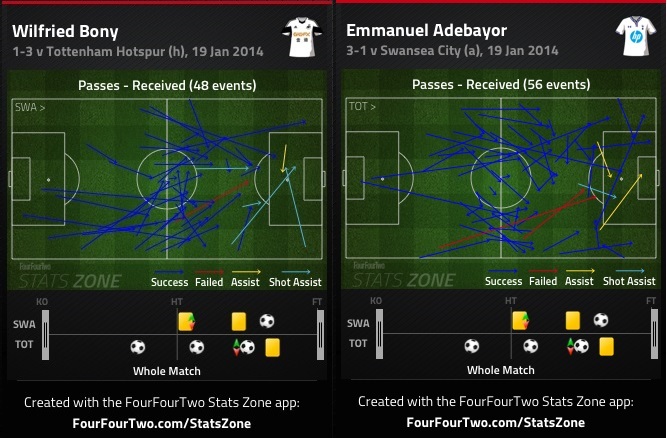 Both were on the receiving end of plenty of passes, with Adebayor receiving 56 passes to Bony’s 48. The chart below shows that they both were able to help the buildup but also still wound up in positions in and around the area to finish attacking moves with shots on goal. They were essentially able to cover two jobs typically assigned to a center forward pairing on their own. We saw this from Adebayor against Crystal Palace as well, when he made Roberto Soldado look redundant. Bony is always left on his own and must certainly miss the attacking qualities from Michu who has been out injured. Bony was on the end of a pass inside the area four times against Spurs and from those passes he mustered three shots and a goal. Likewise, Adebayor took in four passes in Swansea’s area and had three attempts for two goals. Bony added two shots from outside the area after receiving a pass, one of which hit the woodwork, possibly the one threat he was able to offer that Adebayor was not. Most of the passes into Bony were from wide positions, where as Adebayor’s movement was more varied and he took passes from all over. But looking back at the chart, neither of them spent much time operating in front of the opposition area, they were both working the flanks or coming deep to get on the ball. Where as Bony created more shots, six to three, Adebayor was both the busier and more successful passer of the two, completing 39 of 45 passes, an 87% completion rate, but Bony only completed 25 of 35, a 71% completion rate. Bony’s passing was also far more constricted, most being short passes in central positions and offered almost nothing in the final third. Adebayor on the other hand, sprayed his passes much more and was able to play passes into the final third as well. What was both lacking from the two was an ability to win challenges in the air. Adebayor won just one of his five headed challenges and Bony only one of his six. Bony is very much a physical force and Adebayor is not a pushover himself, making it a bit surprising they weren’t winning many duels in the air. Both have put their heads to good use, Bony has won 41 of 86 headed challenges this season and Adebayor scored with his head this week and assisted with it last week. Neither dominated in the air in this particular match. Adebayor was clearly the better of the two, even beyond just looking at the goal tally. But both him and Bony are asked to do very little in the defensive phase, they had one tackle and one interception between the two of them, and tasked with being a major influence when their side are in possession. Bony also hit the woodwork from range, very nearly matching Adebayor with a brace of his own, but never the less, it was a great display from both lone forwards of matching their much needed goal scoring ability with an excellent work rate as well.